When it comes to dealing with hazardous chemicals, accidents can happen. However, it’s important to know what to do in case certain chemicals spill in order to keep you and your employees safe. Always be sure to have an emergency plan put into place in case a chemical spill should occur that includes what to do, who to call, and if evacuation is necessary. 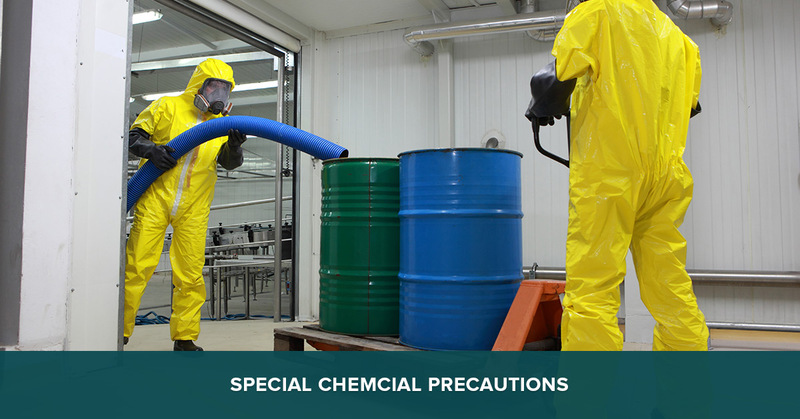 However, when it comes to chemicals with certain characteristics, there are precautions you can take to keep everyone in the area safe and informed. Read on to learn more from the sanitation services professionals at SM Absolute! If you should happen to spill flammable liquids, be sure to get rid of all possible sources of ignition. It’s actually the vapors from the liquid that burn, and they accumulate near the ground. When you call our sanitation services experts, we use spill pillows or pads. These can be backed with vapor barriers to prevent any of the fluids from igniting. If you perform basic cleanup yourselves, be sure to avoid inert absorbents, such as cat litter. Anything used to absorb the flammable liquids need to be put into heavy-duty poly bags, sealed up, and then disposed of properly. Always have spill pillows on hand to place over the spills should they occur. They work the best because they do not have extra dust that can cause the situation to become more hazardous. Once the chemicals have been cleaned up and the spill area has been ventilated thoroughly, you and your team may get back to work. These spills are particularly concerning since any contact with the chemical could lead to serious injury or illness. It is imperative that you are fully protected before trying to clean these chemicals up, and it’s always a good idea to call the sanitation services professionals from SM Absolute. However, if you need to act immediately, ensure that all of your skin’s surfaces are covered and that your gloves can effectively protect you from any of the hazards that the chemical poses. Wearing two sets of gloves is also a great idea! Once you are done with the cleanup, wash your hands and any other possibly exposed skin surfaces thoroughly. Mercury usually isn’t an immediate danger or hazard to anyone, assuming that the area is well-ventilated. Mercury exposure mostly happens through the vapors during inhalation. This means that, if not all of the mercury is cleaned up after a spill, the vapors can be a hazard for years to come. When the spill first happens, block off the area to prevent anyone from tracking the chemical to a bigger area. There are special mercury vacuum cleaners that can be used, but be sure to never use a regular vacuum cleaner. These will push the toxic vapors into the air and contaminate the vacuum. If there is no mercury vacuum cleaner available, you can use an appropriate suction device for the larger drops and an absorbent for the smaller droplets. Whatever might have happened, it’s usually a good idea to write up what happened and why, as well as what was done to clean the area. This can be used both to avoid similar problems and spills as well as anything that may have been missing in the cleanup process. Be sure to set a specific set of guidelines in place so everyone knows how to document a situation like this thoroughly. No matter what the chemical spill or biohazard, you can bet that SM Absolute is here to help. We know how to detect hazards and ensure that they are fully cleaned for the safety of you and your employees. Accidents can happen, and when they do, it’s important to always be prepared to handle even the worst situations. Contact SM Absolute when you have an emergency, and you can believe that we will be there as soon as possible. We have the passion, the tools, the knowledge, and the experience to make sure that your facility is back to the way it was before the spill occurred. To learn more about our services and how we might be able to help, please contact us today!